In 2003 a group of stakeholders came together to try to make a difference in the oral health of all Kansans. 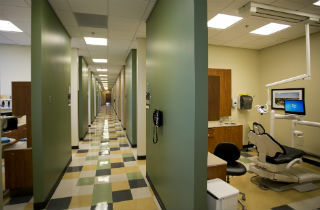 In response to a report card from Oral Health America ranking Kansas as the fifth worst state in the nation in its commitment to a sound, statewide oral health program, Oral Health Kansas was born. Stakeholders in Kansas recognized the critical issues identified within the report and determined the need for a statewide oral health coalition to coordinate efforts aimed at improving oral health in the state. Oral Health Kansas is dedicated to promoting the importance of lifelong dental health by shaping policy and educating the public so Kansans know that all mouths matter. Over the last ten years, oral health policy has surged into prominence in the overall health policy arena. Oral Health Kansas has played a major role in the efforts to raise the profile of oral health as a policy area and public health need in Kansas. 2003 ■ The newly incorporated Oral Health Kansas, Inc. began operating as the state’s oral health coalition. Teresa Schwab helped found the organization and began serving as the first Executive Director. ■ OHK helped establish the Bureau of Oral Health at the Kansas Department of Health and Environment. The first state Dental Director then was hired. 2004 ■ First Annual Oral Health Kansas Conference held. 2005 ■ OHK helped establish a legislative task force to explore access to care for impoverished adults. ■ OHK established the Dental Champions Leadership Program. The purpose of the program is to create a broad, skilled statewide network of people committed to improving oral health in the state. 2006 ■ OHK played a leadership role in securing appropriations and grants to establish the state’s first Advanced Education in General Dentistry program at Wichita State University. ■ Working with several partners, OHK successfully advocated for dental services to become available to people on the Medicaid Home and Community Based Services waivers for developmental disabilities, physical disabilities, and traumatic brain injury. 2007 ■ OHK successfully helped advocate for dental services to be extended to people on the Medicaid Home and Community Based Services waiver for frail elderly. ■ OHK participated in legislative efforts that broadened the Dental Hygienist Extended Care Permit law. ■ The Bureau of Oral Health and OHK worked with stakeholders across the state to craft the first Kansas State Oral Health Plan. 2008 ■ OHK successfully advocated for funding to begin Medicaid dental services for pregnant women. ■ OHK began partnerships with the Kansas Council on Developmental Disabilities and the Central Plains Area Agency on Aging to teach Kansans with disabilities, older Kansans and the people who support them about oral health care. ■ Oral Health Kansas began a project with the Bureau of Oral Health to contract with dental hygienists across the state to teach oral health skills to the parents and caregivers of children with disabilities. ■ The Kansas Dental Association and OHK partnered to present an Oral Health Conference. 2009 ■ The OHK Board voted to no longer solicit memberships, rather to cultivate a network of supporters. In the ensuing months, our list of supporters swelled to over 1,100 people. ■ The Dental Champions Advisory Board was established to oversee the Dental Champions program and increase alumni involvement in OHK. ■ The Boys & Girls Clubs of Topeka and OHK began a partnership to provide oral health education and career information to the children in those clubs. 2010 ■ Through a grant from the Bureau of Oral Health (KDHE), Extended Care Permit dental hygienists in five areas of the state began working with parents and caregivers of children with disabilities to teach them how to care for their teeth and to make oral health a priority. ■ On February 23, 2010, the Pew Children’s Dental Campaign released a report card on dental policies in each of the 50 states. Kansas received a grade of C, primarily based on too few school sealant programs, inadequate water fluoridation and low Medicaid rates for dental services. ■ Oral Health Kansas helped convene a Kansas Oral Health Planning Summit to create the Kansas Oral Health Plan for 2011-2013. ■ The Kansas Clean Indoor Air Act became law. ■ Teeth for Tots, Kansas curriculum for home visitors and parent educators serving families of infants and toddlers, was (or is) designed and published as a partnership between Kansas Cavity Free Kids and Oral Health Kansas. The two organizations also partnered to conduct a Teeth for Tots workshop for more than 400 infant/toddler home visitors representing Early Head Start, Parents as Teachers, Healthy Start, Healthy Families, and tiny-k (Part C, Infant/Toddler Program). ■ Oral Health Kansas, in partnership with Kansas Dental Association and Heartspring, a worldwide center for children with special needs, produced a video demonstrating a model to coach young people with autism the proper skills for toothbrushing. ■ Oral Health Kansas implemented a Healthy Aging grant-fund project through the National Association of Chronic Disease Directors to create a statewide plan to document Kansas initiatives linking medical and dental services to reduce chronic disease. 2011 ■ Oral Health Kansas successfully advocated for significant legislative study of Medicaid dental benefits for adults. ■ OHK wins the Friends of the National Institute for Dental and Craniofacial Research’s Media Award of Excellence. 2012 ■ Oral Health Kansas served as the fiscal agent for the advocacy project to begin fluoridating the water in Wichita, Kansas. ■ Oral Health Kansas successfully advocated to include a Medicaid preventive dental benefit for adults for the state’s new Medicaid managed care program, KanCare. ■ An Oral Health Caucus was launched by Oral Health Kansas to educate lawmakers about oral health issues and policy options. ■ HB 2631 passed both the House and Senate unanimously. The bill included the Extended Care Permit III that OHK supported as well as a provision OHK championed to expand access to Extended Care Permit services in schools. ■ Oral Health Kansas and the KDHE Bureau of Oral Health collaborated with the help of a grant from the National Association of Chronic Disease Directors to develop a statewide oral health surveillance of residents of long-term care facilities. ■ HealthAccess and Marian Clinic in Topeka partnered with Oral Health Kansas on a Healthy People 2020 project to reduce periodontal disease in people with diabetes, heart disease or chronic obstructive pulmonary disease. 2013 ■ Oral Health Kansas published the 2013 Kansas Oral Health Snapshot: A Kansas County Profile. ■ The DentaQuest Foundation awarded Oral Health Kansas a planning grant to develop initiatives under the Foundation’s Oral Health 2014 project. ■ Oral Health Kansas partnered with several stakeholder organizations and launched Fluoride in Kansas, a website to inform the public about the benefits of community water fluoridation. ■ The Dental Champions Leadership Program website launched. ■ Oral Health Kansas became a founding member of the Johnson County Partnership for Older Adults, a collaborative group dedicated to improving the oral health of the county’s seniors. 2014 ■ Oral Health Kansas led the advocacy effort and successfully defeated HB 2372, which would have compromised water fluoridation and misinformed consumers. ■ Oral Health Kansas received a small grant from the DentaQuest Foundation for OHK’s Executive Director to serve on the Foundation’s Midwest Regional Oral Health Connection Team, which aims to build a strong oral health network in the 12-state region. 2015 ■ Oral Health Kansas became a member of the DentaQuest Foundation’s Midwest Regional Oral Health Connection (ROHC) Team. The ROHC team is working with the DentaQuest Foundation to make progress on the Oral Health 2020 goals by building a strong oral health network in the 12-state Midwest region. ■ Oral Health Kansas is part of the Midwest Collaborative Initiative, which supports ongoing efforts to create, build, and sustain local community oral health coalitions in three states: Kansas, Michigan, and Wisconsin. ■ Oral Health Kansas was awarded funding from the Kansas Health Foundation, for a New Water Project. ■ Oral Health Kansas was presented with the Kansas Public Health Association’s 2015 Corporate Public Health Service Award. ■ The seventh Dental Champions class focused on community water fluoridation and developed a series of plans to improve the fluoridation communication and education infrastructure in our state. ■ Oral Health Kansas became a member of the American Network of Oral Health Coalitions. 2016 ■ Oral Health Kansas launched the Thirsty for Health project. The initiative is designed to partner with Kansas school districts to establish plans and resources that expand access to drinking water at schools. ■ Oral Health Kansas launched the Brush, Book, Bed program in Shawnee County (BBB). BBB is a program of the American Academy of Pediatrics (AAP). 2017 ■ Revamped Fluoride in Kansas website. 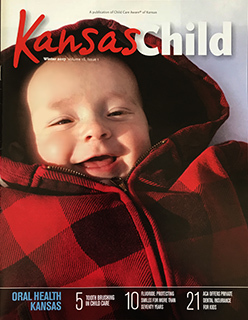 ■ Collaborated with Child Care Aware of Kansas in producing the winter edition of Kansas Child magazine. ■ Launched a new coalition to advocate for a comprehensive adult dental benefits in the KanCare program. The KanCare Adult Dental Coalition offers advocacy, health, and other organizations the opportunity to join a growing chorus calling for full dental benefits to be offered to low-income adults through Medicaid. ■ The first Thirsty for Health focus group was held at Seaman High School. ■ Oral Health Kansas published the 2017 Kansas Oral Health Snapshot: A Kansas County Profile. ■ Twenty three organizations have come together to form the PIT Crew. The PIT Crew consists of organizations in Topeka and beyond to improve the oral health of pregnant women, infants and toddlers in Kansas. 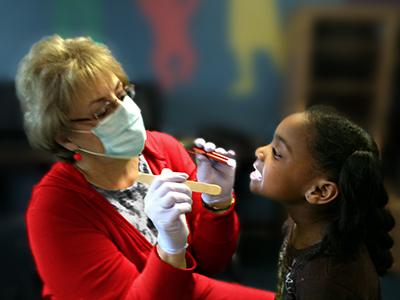 ■ The newly incorporated Oral Health Kansas, Inc. began operating as the state’s oral health coalition. Teresa Schwab helped found the organization and began serving as the first Executive Director. ■ First Annual Oral Health Kansas Conference held. ■ OHK helped establish a legislative task force to explore access to care for impoverished adults. ■ OHK played a leadership role in securing appropriations and grants to establish the state’s first Advanced Education in General Dentistry program at Wichita State University. ■ OHK successfully helped advocate for dental services to be extended to people on the Medicaid Home and Community Based Services waiver for frail elderly. ■ OHK successfully advocated for funding to begin Medicaid dental services for pregnant women. ■ The OHK Board voted to no longer solicit memberships, rather to cultivate a network of supporters. In the ensuing months, our list of supporters swelled to over 1,100 people. ■ Through a grant from the Bureau of Oral Health (KDHE), Extended Care Permit dental hygienists in five areas of the state began working with parents and caregivers of children with disabilities to teach them how to care for their teeth and to make oral health a priority. ■ Oral Health Kansas successfully advocated for significant legislative study of Medicaid dental benefits for adults. ■ Oral Health Kansas served as the fiscal agent for the advocacy project to begin fluoridating the water in Wichita, Kansas. 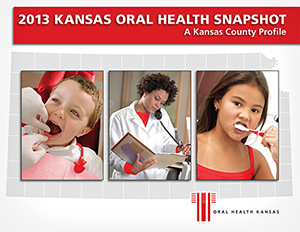 ■ Oral Health Kansas published the 2013 Kansas Oral Health Snapshot: A Kansas County Profile. ■ Oral Health Kansas led the advocacy effort and successfully defeated HB 2372, which would have compromised water fluoridation and misinformed consumers. ■ Oral Health Kansas became a member of the DentaQuest Foundation’s Midwest Regional Oral Health Connection (ROHC) Team. The ROHC team is working with the DentaQuest Foundation to make progress on the Oral Health 2020 goals by building a strong oral health network in the 12-state Midwest region. ■ Oral Health Kansas launched the Thirsty for Health project. The initiative is designed to partner with Kansas school districts to establish plans and resources that expand access to drinking water at schools. ■ Revamped Fluoride in Kansas website.